Look up perseverance in the dictionary and there should be a photograph of Kelly Holmes. The former army sergeant was 34 years old when she became the first female athlete to win two gold medals for Britain at the same Olympic Games. The feat was achieved in the 800 metres and 1,500m at Athens in 2004, but only after a series of injuries had caused heartache for Holmes at major championships. At the Atlanta Games in 1996, Holmes - fourth in the 800m and 11th in the 1,500m - was later told she had run with a stress fracture of her leg and spent seven weeks in plaster. The following year she was the overwhelming favourite in the 1,500m at the World Championships in Athens, but left the track in tears after a ruptured Achilles tendon and torn calf muscle destroyed her hopes in the heats. 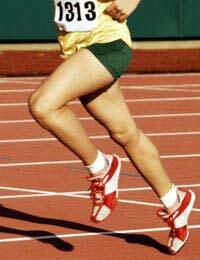 She went into the Sydney Games in 2000 under-prepared, having been laid low by a virus, yet was seventh in the 1,500m and won bronze in the 800m behind Mozambique's Maria Mutola and Austria's Stephanie Graf. Holmes had no such problems at the Athens Games, and it showed. In the 800m, she timed her finishing burst to perfection and fought past Mutola, her friend and training partner, in the last 80m to clinch her first global title in one minute 56.38 seconds. Mutola, the reigning champion, was forced into fourth by fast-finishing Moroccan Hasna Benhassi and Slovakian Jolanda Ceplak. Brimming with confidence, Holmes ran a British record 3:57.90 five days later to win her second gold ahead of Russia's Tatyana Tomashova, and Romania's Maria Cioncan. She became the oldest woman to win either the 800m or 1,500m, much less both, and only the third women to achieve the Olympic double after Soviet Tatyana Kazankina in 1976 Russia's Svetlana Masterkova in 1996. Holmes was the first Briton to win both Olympic middle distance events since Albert Hill at the Antwerp Games in 1920, and only the seventh British female track and field athlete to win Olympic gold after Denise Lewis, Sally Gunnell, Tessa Sanderson, Mary Peters, Ann Packer and Mary Rand. Packer, a school teacher from Reading, had one aim when she boarded the plane for Tokyo in 1964 - to win gold in the 400 metres. In the final she ran a personal best of 52.2 seconds, breaking the European record, but it was not enough. The 22-year-old was two-tenths of a second behind outstanding Australian Betty Cuthbert and had to settle for the silver medal. Cuthbert had been a triple gold medallist at her home Olympics in Melbourne eight years earlier, winning the 100m, 200m and 4x100m relay. The sprint queen of Melbourne was Packer's idol and one of the most gifted athletes of her generation, yet the young Briton was psychologically and emotionally low after the 400m. Her fiancé, Great Britain team captain Robbie Brightwell, narrowly failed to win a medal in the men's 400m, but Packer had another chance for glory in the 800m. Her experience of the event was extremely limited, having moved up from sprints and jumping to the 400m, but she had achieved the qualifying time and was entered for the event as the third British woman. Perhaps it was that tactical naivety that left Packer in seventh place and seemingly out of contention entering the final bend, but a devastating finishing spurt saw her overhaul her rivals and finish well clear of France's Maryvonne Dupureur and Kiwi Ann Marise Chamberlain in a world record two minutes 1.1secs. And with that, Packer announced that her short athletics career was over. Her new dream was to marry Brightwell - who alongside Adrian Metcalfe, John Cooper and Tim Graham had won silver for Britain in the 4x100m relay - and she did.